A criminal investigation has been launched to work out how Rosenberg's diary, a key portion of evidence during the Nuremberg trials, ended up in the U.S.
Senior Nazi Alfred Rosenberg played a significant role in the slaughter of millions of Jews and other non-Aryans considered inferior under the Third Reich. He was convicted of war crimes at the Nuremberg trials after World War II and executed in 1946. 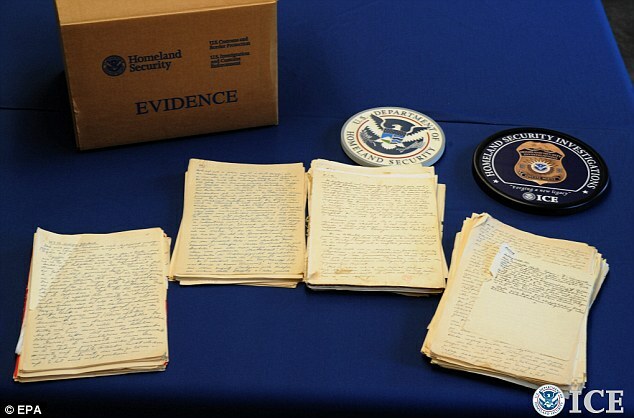 Officials say Rosenberg's diary was smuggled into the U.S. after the war, most likely by Robert M.W. Kempner, a government lawyer during the Nuremberg trials. "The documentation is of considerable importance for the study of the Nazi era, including the history of the Holocaust," according to the assessment, prepared by the United States Holocaust Memorial Museum in Washington. "A cursory content analysis indicates that the material sheds new light on a number of important issues relating to the Third Reich's policy. The diary will be an important source of information to historians that complements, and in part contradicts, already known documentation." The diary offers a loose collection of Rosenberg's recollections from spring 1936 to winter 1944, according to the museum's analysis. Most entries are written in Rosenberg's looping cursive, some on paper torn from a ledger book and others on the back of official Nazi stationery, the analysis said. Early this year, the Holocaust museum and an agent from Homeland Security Investigations tried to locate the missing diary pages. They tracked the diary to Richardson, who was living near Buffalo.